I am building a logic probe/diagnostic tool for cars and was hoping someone could help me with a chunk of the circuit. This device is powered from the cars own battery (~12v) and one feature of it is to supply the probe tip with full battery voltage. This is useful for bench testing components such as headlights and fans outside of the vehicles circuit (a fair amount of current, ~15A constant, maybe a large spike to 30A at start up). This is not so useful in that it enables the user to short circuit the probe, so protection is needed. This works but it is quite large. The logic probe is supposed to be a handheld device and with a big relay taking up half of the enclosure it's hard to pack in many more features. My question is, how would you go about shrinking this circuit while still keeping the same functionality? My version will add a few functions (which aren't quite figured out yet but I'm tackling this one piece at a time) so if more of the circuit diagram is required to help me, please let me know. If you want it smaller then you can replace the big relay for a smaller semiconductor. Or place a circuitbreaker by the clamp on the positive battery terminal. That way the probe can remain small but you'll have to walk to the battery when you trip it. I'm not sure how reliable this setup is. Instead I would go for a circuitbreaker (or a latched semiconductor overcurrent protection) that will open the circuit when too much current flows. Or make it even more sophisticated and add a small resistance sensor that will prevent you from applying the full power of the battery to the probe when the resistance is too low. Just a small current source and a comparator are needed. It could even light up an LED to tell the user that there is a short. Feature creep has been very real since I've started putting this together and I've been thinking of using a microcontroller to handle the logic instead of discrete components. Going this route the initial circuit wouldn't work anymore. Well it would, but it would cut power to the AVR or whatever I end up using on a fault. 2) at 0v (ground) to test components in circuit replacing it's ground wire with the probe, i.e. circuit is suspect of a faulty ground, replace the ground wire at the connector with the probe. If the component works your suspicions were correct. 3) a floating state to be used as a multimeter. In the "instructable" in the OP, #3 is where that project stopped and mine begins. That probe simply turns on a green LED if the probe is close to ground and a red LED if the probe is close to positive battery supply. I would like to display and use that data the probe is picking up. Showing current, min, and max voltage would be very nice and doable I think . If I touch on a signal wire it would be nice to display info about it (this is where the project starts getting way over my head, basically a mini oscilloscope) but just displaying that it is a signal wire should be good enough. And one extra feature which is to load test a control circuit. A switch to short the probe to ground through a hefty resistor and display the voltage drop if any. Jeroen, could you elaborate on the last part of your reply? I'm new to electronics outside of relatively simple projects. So it's a circuit that would measure the resistance from the probe to ground, and then allow full battery voltage if the resistance was an acceptable level, i.e. not shorted to ground? This is a slick solution and I feel like it would be a good feature for the probe to measure resistance and I could use an ADC on the AVR to read/display it on a screen of some sort. Ian, those seem like the perfect solution except they are all smd that I've found (at least for high side switching). SMD is fine for the final version but makes prototyping much more difficult. It would tie in well with a microcontroller, most from what I've seen have an output pin that sends data about the current draw which could be useful. Maybe I will pick up some smd adapter boards and give these a shot if I can't come up with anything. Only thing I've noticed about these is the current they can source seems to be around 16 or so amps. This is above the expected constant load but some motors will have a large spike of current to get them going which may make the ic think it's shorted. Sequoia, a fuse is a good idea. I may use a traditional one as sort of a back up failure mode. Those PPTC fuses I don't think will work for this application though. I was looking through the data sheet and it lists "time-to-trip" in seconds! One of them was rated to trip in 10 seconds, way way too long I think to be safe for this tool. Plus they reset on there own, on this tool I would like the user to know that the probe was shorted and have to manually reset it somehow. Thanks to all of you for the suggestions and info. This seems like a good solution to me, all of these components are super cheap. But that circuit seems to be only for switching low-side, do you think it could be adapted for high-side? I think I should be able to use just that circuit but have the NPN transistor driving a PNP mosfet instead of the load? A constant current source if powered by 12V and sends a small current out of the probe. Rx is whatever is between the probe and the ground. The voltage drop across Rx will be proportional to the resistance according to Ohm's law. Thus a lamp will drop more voltage than a short through the chassis. A comparator compares this voltage drop to a reference voltage. If it is higher than the reference voltage it will give a 'clear' signal. 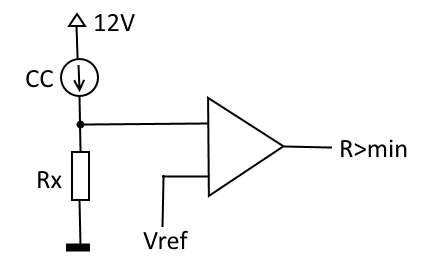 That 'clear' can be used to open a suitable relay/transistor in series between 12V and the probe tip. That relay/transistor will act as a high side switch that is opened when the button is pressed AND the comparator gives a 'clear'. Sorry to say, but htis probe looks like the perfect way to allow in-experienced people who have no idea what they are doing blow up vital electronic parts of there car!! Having a probe that can fire 15A of battery voltage down various random wires or into components sounds like a disaster waiting to happen to me! i'd add a micro and have the probe start in a higher impedance mode first, ie apply Vbatt through a 1k resistor or something. Then you could have a low impedance output mode, used with caution! Project sounds similar to the PowerProbe. $124 for what sounds like a simple circuit/product. Thank you for the sample circuit. I'm going to place a decent size order at digikey with a little of everything suggested in here so I can make some prototypes and mess around. Max, you are right. This could easily cause damage if used incorrectly, as could most tools. Hopefully the user will have used the probes other functions to make sure it is safe to apply power first! A sanity check before allowing full power is a good idea and I will implement it somehow. Sparx, yes this is very similar to the power probe. Actually it's what caused me to want to build this, I saw a guy at work using one and I thought the probe was a lot easier than my bag of jumper wires. Figured it would be fun to build, and possibly throw some extra features into it.